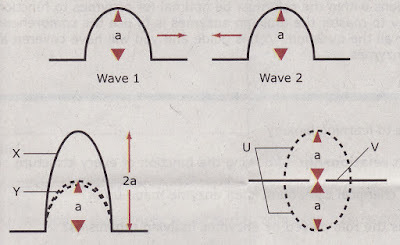 Two waves, Wave 1 and Wave 2, of the same frequency, wave length and amplitude, approach each other. State the principle applied in the phenomenon above. When two coherent waves travelling in opposite directions meet, the resultant displacement is the vector sum of the displacements of the two waves at the point of interference. What is happening at Y and what is X? At Y, where two pulses of the waves overlap, constructive interference occurs. X is the resultant pulse of the overlap. What is happening at U and what is V? At U, where a pulse of a crest and a pulse of a trough overlap, destructive interference occurs. V is the resultant pulse of the overlap. It shows zero displacement; a state of calmness or no wave pulse. What is expected after the meeting of Wave 1 and Wave 2? The two waves travel in opposite directions along their original paths, unaffected by each other. Note: Interference only occurs at the meeting point between two pulses of waves.